The verdict of the unnamed author of Heywood's Guide, where this advertisement was published, was that all the hydros in Matlock were good. 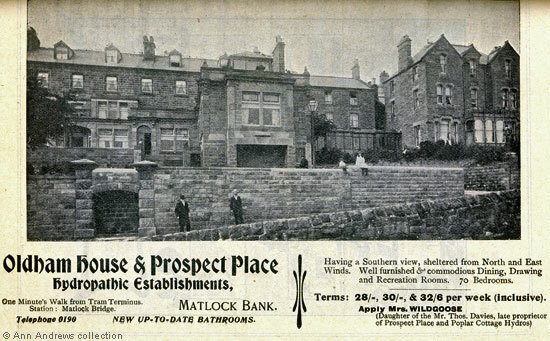 "There is in Matlock no lack of choice, and if there is any difficulty it is that of selection. It is hard to choose between so many places and such various attractions". Oldham House & Prospect Place on Wellington Street was run by Rachel Wildgoose, the daughter of Thomas Davis, at the time. Whilst the hydro's position isn't mentioned, the neighbouring Rockside Hydro claimed to be almost 800 feet sea level and both Oldham House & Prospect Place and Rockside were close to the tram terminus at the top of Rutland Street. The large window in the centre of the building formed part of the recently built (1899) dining room; this room was also lit by a large skylight. We can see the original conservatory behind the two children sitting on top of the hydro's wall. So although it is claimed elsewhere that this image dates from 1890, it has to have been taken between 1899 and 1903. As far as I can tell, this is the first time Oldham House and Prospect Place were linked together in an advertisement; prior to then Prospect Place and Poplar Cottage (later Jeff's Poplar Hydro and Chatsworth) were part of the estate of Thos Davis and Sons. The Vernon Lamb Archive, Hydros and Convalescing, Index has 15 photos of the hydro's staff and guests. The interior of the conservatory features in several of these pre WW1 photos. Advertisement for the Oldham House & Prospect Place from "Abel Heywood's Guide Books, With Cycling, Walking and Driving Routes. Matlock Illustrated." (1903) Abel Heywood & Son, Manchester & London. Advertisement in the collection of, provided by and © Ann Andrews. Kelly's Directories of 1895 and 1899 list Oldham House as one establishment and the combined Prospect Place & Poplar Cottage under Thos Davis and Sons in 1895 and Thomas Davis and Sons at Poplar Cottage in 1899. Mr Davis had died in 1891 and his daughter did not buy Prospect Place until 1899.